Category Archives for "Movie Review"
Jiro Ono is a man who has completely dedicated his life to making the best possible sushi. This documentary follows his daily routine and that of the people who work with him. In 2011 when the documentary was released, Jiro was 85 years old, and widely regarded as the greatest sushi chef in the world. He still comes to work every day, except national holidays. Later Jiro reveals that when he was a child he was kicked out of his home at the age of nine, so he felt he had to be successful; he had nowhere to go if he couldn’t make a living for himself. Jiro says that when felt his younger son was ready to open his own sushi place, after years of apprenticeship, that he essentially told him the same thing, that he must go out into the world and be successful, because he couldn’t come back to work at his place. I was surprised at how much this film was not just about sushi, but an inspirational story about a successful small business owner and the effect he’s had on the lives of the people around him. The sushi information was amazing too though. The documentary gives a thorough behind the scenes look at what goes in to preparing some of the best sushi in the world. You get to see Jiro and his staff go though their daily routine to get ready for each meal; they carefully cut and taste each piece of fish to make sure it’s just right, they prepare the sushi rice with a process they’ve perfected over many years, they massage the octopus for almost an hour to make it tender, and so on, making sure every step is completed as close to perfect as possible. 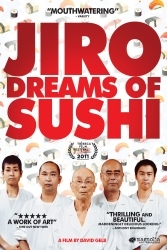 Jiro Dreams of Sushi is 83 minutes long and currently available for streaming on NetFlix. On Amazon it is available on Amazon Video and DVD.